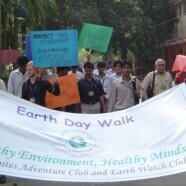 Once again the Earthwatch Club is recognizing Earth Day – Thursday 22 April 2010 – by organizing its annual walk event. 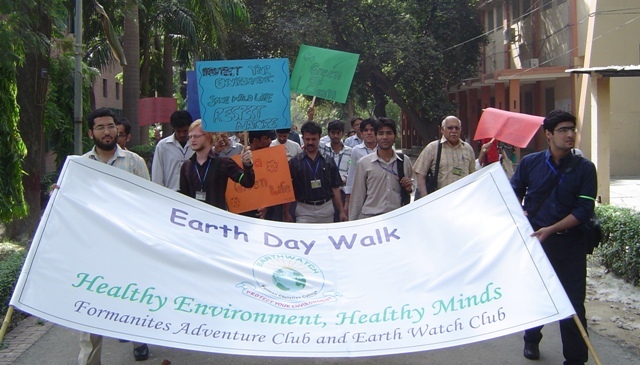 The walk helps to create awareness about environmental issues facing humankind. The program starts at 10:00 a.m. with a walk around the campus, starting from the OpenAir Café, proceeding to the Armacost Science Building, the Ewing Memorial Library, Sinclair Hall, Susheela Building, Ahmad Saeed Administration Building and ending at E-Building. At 11:00 a.m. there will be a short video film and an interactive panel discussion on “Environmental Issues Facing Pakistan” in E-25. W. From 12:00 noon till 1:00 p.m. students will discuss the FCC Students’ Action Plan, also in E-25. The discussion is open to all students who are interested. ALL EARTHLINGS WELCOME!